As part of the improvements, all 40 guest rooms and 11 waterfront villas have undergone contemporary upgrades; the swimming pool has been transformed into an infinity pool complete with swim-up bar; enhancements have been made to the pool terrace and its surrounding landscape and the beach has also witnessed a major clean-up. 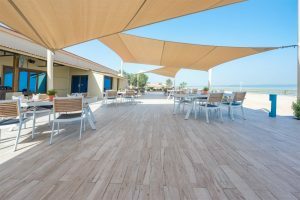 Located just 60km from Dubai and 30km from Ras Al Khaimah, Barracuda Beach Resort is situated on the edge of the Umm Al Quwain lagoon and next door to Dreamland Aqua Park. The resort consists of 20 studios, 12 one-bedroom units, eight two-bedroom units and 11 waterfront villas which boast private, enclosed lawns and BBQ facilities. The resort also features two F&B outlets, including Aquarius, an all-day dining restaurant offering a variety of Mediterranean, Asian and Arabic dishes and Thunder Road, an Italian pizzeria and grill restaurant. Guests looking for a more relaxed dining option can order a platter of freshly marinated mixed meats and seafood from Aquarius restaurant, which can be cooked at the BBQ park located on the beach. As well as the newly opened infinity swimming pool, leisure facilities include a children’s play area, volleyball and basketball court, cricket ground and an indoor games centre featuring table tennis and billiards. 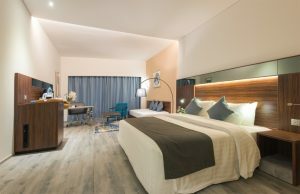 “Upgraded with leisure and adventure visitors in mind, the resort is now fully-equipped with everything the modern traveller requires for the perfect family or group staycation,” Harikrishnan said. Alternatively, guests can check out Dreamland Aqua Park which is situated just next door to Barracuda Beach Resort. Featuring a variety of water slides, lazy river, wave pool and children’s aqua play area as well as several food and beverage outlets and a mini zoo, Dreamland is the perfect family day out. The resort also features a large and well-equipped banquet and meeting room facilities suitable for motivational team-building days and board meetings as well as for large weddings and special events. Harikrishnan, added: “Being less than an hour’s drive from Dubai, we are an ideal venue for companies looking to enhance team spirit and dynamics with a motivational team building event, training seminars or even a staff party. “One of the major benefits of holding company events here, is that delegates really can escape the stress of Dubai and Sharjah, relax and unwind in an unspoiled resort environment and enjoy a fun day out with their colleagues.